Stylish and efficient are two words that perfectly describe these Beaufort Greaves. 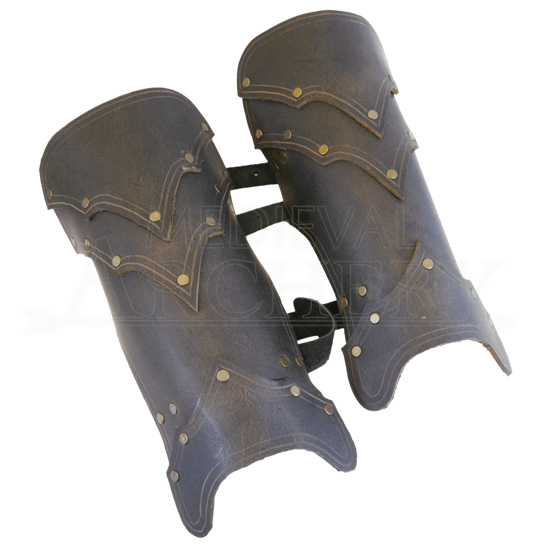 Far from just decorative, these half-greaves are handcrafted from quality materials to ensure that they not only look fantastic, they also provide great protection, too. Like the breastplate of the same name, these greaves possess a simple style of construction, taking one base plate of leather and attaching successive layers on both the top and the bottom. The end result is not only a greave that is quite protective, but a greave that also happens to look quite stylish, too. The greaves have a bit movement, which means they are fairly non-restrictive when worn. The greaves are available in two different colors, either brown or black. They come in only one size, although as they do feature belted leather straps for securing them to your leg, they are quite adjustable and can fit a wide range of leg sizes. These Beaufort Greaves are the perfect way to complete any armored outfit you might consider wearing, either to a LARP, a convention, a fair, or anything else, serving to not only make you look protected but also quite intimidating and awe-inspiring, too.